Hello, My name is Nick Crawford. I was born in Iowa City, IA and lived there until I was 10. My family then moved to Panora, IA where I finished out school I was involved in many activities like Football, Wrestling, Golf, FCCLA, and the National Honor Society. I then chose to attend Central College in Pella, IA where I pursued education in Environmental Studies. Here I learned about how the Earth works from weather, to rocks, to water, environmental safety, and biology. I love science! I also love spending time with my family. I have a fraternal twin Jordan, a sister named Kaitlyn who is now in high school, and a younger brother Tommy. I currently live with my fiancé Elizabeth Keeney in Indianola, IA but I still get to see my family on a regular basis since they also live in Indianola now. 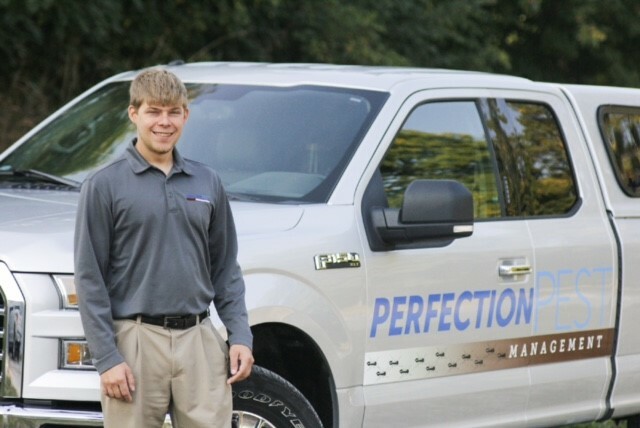 Here at Perfection Pest Management I enjoy being able to get outside move around and not be confined to a chair or desk all day, I like to physically do things. I plan to do big things within this company, I joined the team when Allen was just starting out and the sky is the limit. I will bring quality service and respect to our customers every visit.